categories > Comic Talk and General Discussion * > DD will be shut down for a few hours on Tuesday, Feb 2! Drunk Duck will be hut down for a few hours on Tuesday starting at 12am PST so changes can be made to the full site, inluding adding comic stats, fixing comic image links so you can add new ones, it will be easier to post stuff in the forums without it being mangled too. There may be some other changes I can't remember it all right now, but stats and the forums are the big ones. Nice!! This is really big!! Thank you guys for all this!! That's awesome news, I can't wait to see the changes!! Groundhog day… will the duck see his shadow? Wooo good luck I hope everything goes smoothly! The site is updated now. Stats are LIVE- they only updates once a day though to save load on the server. You'll have to wait till 5am PST. 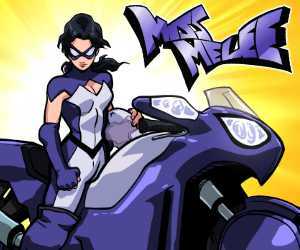 Comic link adding with images WORKS, as does forum posting. 4 line breaks with no spaces. YAY! -adding extra spaces does not work though. I'm assured that PQ notifications will be coming. Whoa, and we get a preview button now? Awesome! I just noticed, though, that “quote” is misspelled as “qoute” in the second instance when you quote something. Hey, and double quoting! Look at that! Triple quoting? Now I'm just getting greedy. Alexey did a great job! PQ notifications have been added! I've been sidelined for ages and I can't Believe the day I finally look in is the same day PQs are working again! I'm not a fan of the new 1MB limit for pages, it's not an improvement, and judging from the bug topic I'm not the only one being concerned by this. Most save their pages in PNG and that makes the files a bit over 1MB but it keeps all the right colors and quality of the pages, and they look as they should. My understanding is that this isn't actually a new limit, it's a limit that was always there but wasn't working right because of bugs. It's there because running the site costs money and bandwidth is expensive - but I believe Ozone and co are currently looking into whether they can get away with setting a higher limit. Just to raise the question: If it came down to it, is a significantly higher image filesize something you'd be willing to pay for? There's only so much the Duck can afford to give away for free but premium membership may well be an option. (Note that I'm not speaking in any sort of official capacity here - it's just an idea). BTW, have you had a play with the different levels of compression on JPG? JPGs are a lot better on the higher quality settings and still smaller than PNG. 1. Can we please fix that bug that defaults the closing quote tag to /qoute rather than /quote? 2. Editing posts as BB code rather than WYSIWYG is fine, but if we don't have WYSIWYG now is there any chance of a ‘preview’ button so we can see what messages look like before we post? My understanding is that this isn't actually a new limit, it's a limit that was always there but wasn't working right because of bugs. Yeah, I got that feeling, which makes me think that it's a really old limit that isn't in phase with how the internet is today. 1MB is too small for art files. Double it to 2MB and it should be ok for most. Just to raise the question: If it came down to it, is a significantly higher image filesize something you'd be willing to pay for? Hmmm. Not sure. Having to pay to upload high quality pages that other artwork sites already provide is gonna feel sketchy. I love Drunk Duck though, so it would depend on how it unfolded. ]BTW, have you had a play with the different levels of compression on JPG? JPGs are a lot better on the higher quality settings and still smaller than PNG. Having the setting at max/12 still gets the files over 1MB for me. For the recent page I had to lower the quality to 10. It's not like the change is extremely noticeable for the casual reader, but for me it hurts to see the pages get slightly washed out and get a bunch of artefacts when I have uploaded with the crisp PNG for so long. Naturally, artists want to show their pages in as hight quality as possible. Agreed…that shouldn't be too tricky of a change. Hopefully oz has told Alexey about it. You're in luck, because there IS a preview button now! It's the green checkmark button on the right. Irrevenant is correct here about it being an old limit that just wasn't working. Just wanted to say for posterity that this isn't something we've talked about at all. If we were ever to add something like premium memberships (or make any drastic change for that matter) it would involve lots of discussions with the community. Also, I found this website that allows you to compress .png files: https://tinypng.com/. Unfortunately it doesn't let you choose the compression %, but I'm sure there are others that do. I just tested it out and it was able to take a 1.4 mb png image down to less than 1 mb. My pages usually end up at 1,3 MB. I checked one of El Cids pages and they seem to go at around 1,2MB. Genejokes pages are around 1,5MB. Charby uses PNG also but gets just under the 1MB limit due to the pages only being 700 width. Also, I found this website that allows you to compress .png files: https://tinypng.com/. Ah, too bad. It did pretty good with my test image. No no, it's totally cool to throw out any kind of idea. :) I just figured I should comment. I think it probably works great when the coloring is simpler, such as with cell shading. When a lot of color shades and transparencies are in the picture it gets trickier to compress without it being noticeable. -Graphic design is my job, I know this stuff more intimately than I care to. That said I have been around long enough to know it is NOT ever a good idea to go against a tide of community sentiments so I have asked Alexey to up the file limit to 1.5 meg and add a note on the upload pages to inform people that is the limit. There have been too may complaints about this and it will be easier to take the hit and increase the limit rather than follow other alternatives. -Again, this was always a limit in place on file sizes at DD but due to a bug it stopped working (now it works again because the other fixes to the site), the 20 meg thing was about multiple files and was a mistake anyway. Soon there will be a poll for people to vote on the new features they'd like for the next round of fixes. My main negativity towards JPG is unfortunately related to Drunk Duck since the site does some extra compression to the format when uploading. 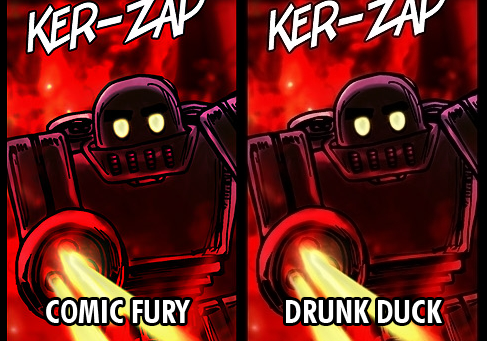 The same JPG picture looks different when uploaded to comic Fury and Drunk Duck. It is especially visible with red colors so here is an example. On DD it looks slightly smudged and some of the color intensity is dropped. Unsure if this has ever been reported but it's kinda odd. That will be because pics above 960 px are recompressed when they're resized. Red colours ALWAYS suffer with higher compression jpegs. I'm in talks to increase file widths to 2000 pixels and file size to 1.5 or 1.75 meg. If you have a 2000px wide pic that's above that file size though you'll still need to compress it. Limits are off for now. the width limit (960 px) is still in place.